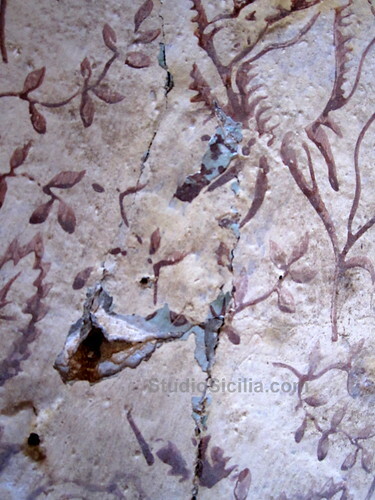 Layers of casein paint and limewash cover the walls of my studio in Sicily. The vines were painstakingly hand-stencilled by villagers who lived in this room many years ago, who painted the walls with designs they found beautiful. I've taken photos to record their work before I slap fresh white plaster over them next week. Art is hard work. Writing is even harder work for me. My art, life and work are one, and I am never not working at them. While some readers of my blog may think I'm on perpetual holiday, it's quite the opposite – I NEVER have holidays. All my travels are for seeking subjects and working on projects, many of which never come to fruition – in public at least. The number one thing that will get you to where you want to go – exhibitions, grants, whatever – is hard work. And focus. And remembering every day that's it's a competitive field we're in, where most sensible people drop out because they have more realistic priorities like mortgages, children, and occasional holidays from them (btw I don't have holidays, I have research trips). Ask yourself: Who's doing work like yours? How can you do it better than you are now? How is your work unique? Why should people care? (Because most people don't care about art, they have more pressing concerns.) And no excuses for not doing work related to your art EVERY day, whatever that work may be. I don't have any tricks, or shortcuts. It's just getting the work DONE, and out the door, and into the world. Work hard, work well, set lots of deadlines for yourself, focus, don't give up. Pretty vague, eh? Yet, putting these ideas into practice will convince others over time that you're worth investing in. Because art – at the prices we expect people to pay for it – is an investment, a financial commitment. Part of why I'm planning this studio is I'm interested to begin collecting art. I want to learn how collectors think by becoming one. I'm scouring my contacts ? and theirs – for artists whom I want to collect, and having a hard look at their CVs, and how they talk about their art and their world. Are they producing work regularly? Are they showing it? Working on interesting projects? Doing more than just talking about themselves? What makes them special? Because after awhile, most artists I run across start to blend together. (Many say there are simply too many of us, too much art being produced for the world to consume, and not enough people to buy most of it. They may be right.) Some artists dither. They don't have much of a vision, or aren't expressing it. They navel-gaze too much for my taste…. Social media (a great way to meet other artists) can become a huge time-waster but can also be a virtual salon – I get my fix over at the Facebook page of Jerry Saltz the New York art critic, where I take the pulse of art in my home country. I use social media like chocolate: only the best, only a bit in each session to be savored, and only at the right time. The New York Gallerist Ed Winkleman's blog: This section is particularly valuable for artists. and then there's the always-entertaining creative business-card cartoonist Hugh over at Gaping Void, whose books I recommend to EVERY creative, whatever and however they do their thing. There's a general trend in the artworld today for artists to be more entrepreneurial with the many communication tools we have now. If you want to make a living at selling your art (not at teaching, or other peripheral activities)…you've got to mean business, and that means treating yourself as a business owner, treating your art as work/a product (however you may feel and talk about it), and your life as your work and vice-versa. Final thought: There's nothing special that exempts art or artists from the world of commerce if we're selling our work, we don't get any slack just because we're making what we call art, because others might well call it something else. Advice I will definitely keep in mind as I figure out how to monetise my writing output. What you say is so true. I wouldn’t dare call myself an artist, and in fact after a stint in publishing became so disillusioned with the idea of “there are so many of us” I crept back into my blogging shell and shelved all vanities of any other type of writing. And yet, isn’t it about searching for meaning? And isn’t collecting a way of constructing meaning around ourselves? And isn’t creating a way of saying I was looking for this very specific something that was missing in the world and no-one else had done it so I felt obliged to do it and thereby make my contribution? @Gweipo How right you are: the search for meaning and expression is such a fundamental part of art, it is often left out of the discussion between artists who consider themselves ‘professional’. Yet I think another crucial aspect is often left out of the equation: – how much work and how many failures – are required to make anything happen. Talent is just the beginning, so many have talent. Hard work and self-criticism (without self-sabotage) are just as important, if not more.